The Soviet Union does not enjoy a reputation as a consumers' paradise, and its product designs were seen as functional and utilitarian rather than must-have objects of desire. But a new show in Moscow is highlighting Soviet creativity, quality and style in a number of areas. "Also they had their specific factories, special factories, that were part of the Toy Institute, where they were experimenting with toys. And they had like a library, a library of toys. 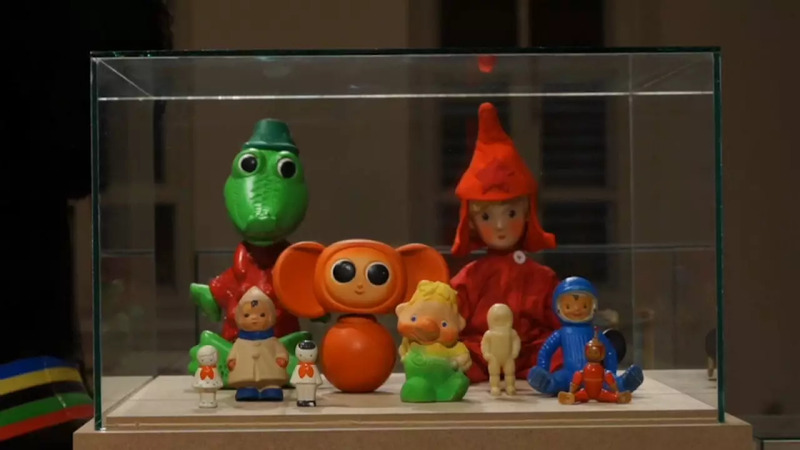 Because the Soviet Union, it was even before the 60s, invented when children can come to the library, toy library, take a toy home, play with it, and then the next day return it and change it for another toy," says the Director of the Moscow Design Museum, Sasha Sankova. A Soviet Toy Institute was created to develop toys that would help to raise children according to Soviet ideology, as the Communists sought to globally transform society by reinventing it in every way. The All-Soviet Scientific Research Institute for Technical Aesthetics, or VNIITE, was established in 1962,focusing on durability and bettering equivalent western goods. VNIITE held an international seminar in 1971 in Minsk, where designers from all around the world could share ideas. One design team came up with an idea for a range of wearable and portable electronic devices that incorporated digital watches - some of which seem remarkably similar to the "wearables" being developed today. "What the Group of Dmitry Azrikan, (from VNIITE), who lives now in the United States, together with his colleagues like Alexei Kolotushkin, they were creating, they said that there will be no watches by themselves anymore, that watch will be always part of the TV, of the computer. That watch will be everywhere," says Sankova. Visitor Zhannat Idrisova says she can still remember the Soviet styles her mother wore. "I always thought that Soviet industries including light industries were good. I remember my mother's dresses since childhood. And comparing them with those being sold in shops like Mango or Zara, I know that those dresses were not worse than these in terms of quality, design or colour," she says. With the fall of the Soviet Union, most factories and research institutes were privatised. Russia's new entrepreneurs were not interested in preserving the history of Soviet design and as a result, many of the design archives were lost. Sankova and her co-curator Olga Druzhinina went from designer to designer looking for materials and prototypes in personal archives in an attempt to recreate the history of Soviet design. Due to the economic instability in the Soviet Union during the Khrushchev era, people had to sign up years in advance to have many of these products. But despite being a reminder of difficult times, the designs themselves still hold strong appeal today. "The most important thing in this exhibition, I think, is that the goods produced in the Soviet Union were beautiful and functional," Idrisova says. "Look at the part with the furniture, is it worse than Ikea? I think Western thought was welcomed and used, but Soviet projects were good. Despite the deficit of resources, and maybe deficit of professionals, it was all quite good." Some of these objects are becoming design classics, like the small-scale multifunctional furniture created for the shoebox-sized "Khrushchevka" apartment blocks of the 1960s, and while Soviet designers took a lot of inspiration from the west, like using patterns from Dior, for example, they worked to produce products that would function better and last longer than those created by the capitalist economies. Many are still in use today. The exhibition runs until January 12, 2018.